Whilst borrowers fear a rate rise, savers instead salivate at their prospects especially as the banking crime syndicate is now into its 6th year of the stealth theft of purchasing power of savings as the banks continue to suckle on the teat of the Bank of England through a myriad of schemes that results in effectively providing the banks with unlimited funding that has resulted in the collapse of savings interest rates that began in May 2012 and have been kept at sub inflation rates of systemic theft. 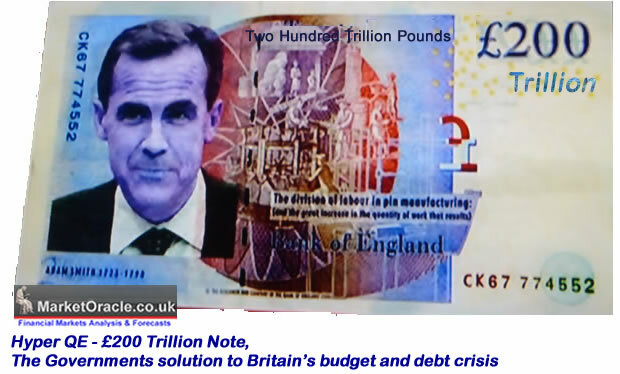 The Bank of England's Wizard of Oz front man, Mark Carney has been busy during the past few weeks putting up ever thickening screens of smoke and mirrors in a thick cloud of confusion that surrounds the prospects for UK interest rates so as to appease all and mask the banks true intension. "The housing market was now the greatest risk to the domestic economy”. "There's already great speculation about the exact timing of the first rate hike and this decision is becoming more balanced," he said. "It could happen sooner than markets currently expect." "We are fully aware that the environment of low and predictable interest rates necessary to nurture the recovery could encourage excessive risk taking in financial markets and by households,"
"In November, the Bank's financial policy committee announced initiatives to reduce the stimulus being provided by the authorities to the housing market." "We will not hesitate to take further proportionate and graduated action as warranted." "The best collective judgement of the MPC (the Bank’s Monetary Policy Committee), which I share, is that there is additional spare capacity in the labour market that can be absorbed further before we would look to begin to normalise interest rates, in other words raise interest rates." “We are looking to manage monetary policy to achieve the inflation target in a way that supports a durable expansion. "The big picture is not whether the Bank Rate goes from 0.5% to slightly above that lowest ever level. " "That's not the big picture, the big picture is where interest rates go in the medium term, because if I am taking out a mortgage... and if I am thinking of investing in a new plant, if I'm thinking about taking on new people, that's what I care about." "If you look at financial markets their estimation about the next three years is around... let's call it 2.5% - slightly lower or it can be slightly higher - we see that as not inconsistent with returning the economy to where it was before." Blasting away the smoke and shattering the mirrors to reveal the underlying fundamentals for RISING interest rates this year, this follows on the back of what Mark Carney was stating barely a few months ago of keeping UK interest rates on hold for several more years. Now Mark Carney's flip flop message has sent market commentators and analysts scurrying to rewrite their expectations for UK interest rates for 2014 and beyond. My consistent warnings have been to ignore Bank of England warnings of bursting the UK housing bull market for all Mark Carney is doing is playing a game of misdirection where whilst publically stating one thing of threatening to burst the bubble whilst privately the BoE acts to do the opposite by ensuring that the housing bull market remains well supported. However, has everyone forgotten what Mark Carney did for Canadian House Prices ? A reminder he pumped them up by over 80%! He is following the SAME PATTERN in the UK! For that is why he was hired because he is an expert at inflating housing market bubbles! All Mark Carney did by his latest statement is in effect to act as a character out of Game of Thrones series, hiding his crafty smile behind smoke and mirrors that stealthily seeks to inflate house and other asset prices. So, in my opinion Mark Carney's statement amounts to nothing more than a chess piece move that the Bank of England is playing in this case its objective is to act as a back covering move in case the bubble gets out of control, because there is NOTHING that the Bank of England WILL Do to kill off the housing boom that is under way because THEY played a pivotal role in ENGINEERING it into existence both in terms of supporting their bankster crime syndicate brethren at the still mostly bankrupt banks, as well as following the dicatats of their political masters who are focused on engineering an election boom and to hell with the consequences in terms of inflation and interest rates, just as Gordon Brown's Labour government sought to bankrupt Britain to maximise labour votes in the run upto the May 2010 general election as I wrote a year beforehand. The bottom line is an election boom is now underway that will manifest itself in house prices inflation averaging at least 10% per annum, and normalisation of the UK interest rate market that will drag the Bank of England's base rate higher no matter what the Governor of the Bank of England states. The banking crime syndicate has always been quick to raise rates and so it will be again this time around where the rate rises will materialise long before then Bank of England ushers in its first base rate hike. In this respect the fixed interest mortgage market has already experienced a series of rate rises over the past 6 months, with the average fixed rate rising from approx 2.5% to now stand at 3%, which is still less than half the rate borrowers tended to pay during the last housing market boom. So in effect are still typically being subsidised to the tune of at least 50% of the interest! Therefore the UK mortgage market has a long, long way to go to get to anywhere near the state that resembles that of taking the punch bowl away, probably WHEN base rates will be standing at around 5% we can say the decade of artificially low tax payer funded mortgage interest rates has come to an end. Meanwhile the calculation for buying a house remains very simple which is that it remains far cheaper to buy a property than to rent a property as covered at length in the UK Housing Market ebook (FREE DOWNLOAD). If you are a borrower then off course the smart thing to do would be to FIX your mortgage for as LONG as possible. Lately, virtually every week the Bank of England bellows more white smoke out of its Vatican-esk chimney that clouds over the housing market to give the illusion of doing one thing when the reality is of doing the near the exact opposite. So it is no wonder that many market commentators MISS WHOLE BULL MARKETS! Especially as journalists are just that journalists! Good at writing reams and reams of clueless drivel, good at getting dolled up to talk garbage at length on the TV. And thus it is so with the BoE's last utterance to CAP UK Mortgages that many clueless journalists are running with. Specifically, the Bank of England to prevent a housing bubble (deflate the London bubble) has instructed the banks from October to limit mortgages of more 4.5X income to no more than 15% of NEW mortgages. Diddly squat! - NOTHING - ZERO IMPACT on the UK Housing MARKET - ZILCH! All the media hype is around a Big FAT ZERO! A couple collectively on 100k per annum will still be able to borrow £450k BEFORE they hit the mortgage limit buffers and even then they could still borrow more than 4.5X income i.e. as much as £600k for maximum profit from the Help to Buy tax payer give way. Which means even in stratospheric house prices London, the BoE's announcement will have virtually zero effect. Whilst in the rest of the country, a couple on combined average earnings of say £60k can still borrow upto £270k before hitting the mortgage buffers, which given that average house prices are £185k means zero impact. 4.5X is pure media spin, and it boggles the mind how dumb the mainstream financial press is to swallow it whole. Remember in years past the limit was 3.5X a single income and X3 for JOINT incomes! A 4.5X cap on a JOINT income is doing NOTHING to cap mortgages! Whilst today less than 8% of mortgages are at X4.5 income which is set against an allowable limit of 15% for such mortgages! In fact rather than doing nothing to prevent a housing bubble this will likely have the OPPOSITE effect for it reinforces the underlying fact that the Bank of England is ENIGINEERING the housing bubble! Just as the Bank of England talked of always imminent risks of deflation whilst INFLATING prices. 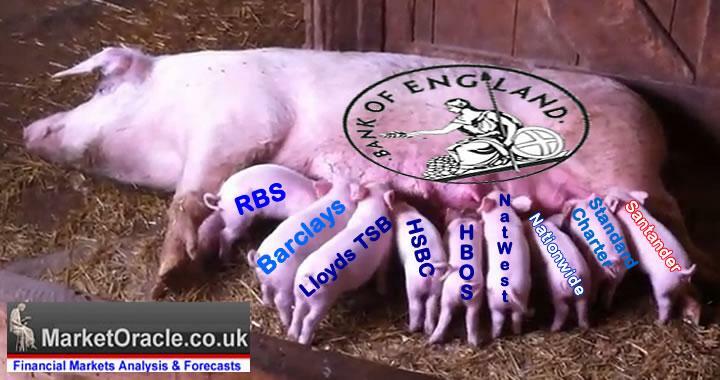 Understand this INFLATING PRICES be they asset or consumer is written in the DNA of the Bank of England. Therefore the Bank of England's announcement should be taken as a warning to expect average house prices to SOAR over the coming years. Whilst mortgage interest rates have already begun to slowly rise, savers would naturally assume that savings interest rates should also have started nudging higher, nothing is further from the truth as illustrated by what is taking place in the cash ISA market ahead of the introduction of the New £15k ISA's. 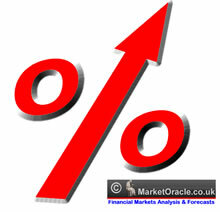 However, It should not come as a complete surprise that after more than 5 years of an artificial highly manipulated UK interest rates market for the primary purpose for funneling tax payer cash into the bankrupt banks (QE) that the already extremely low savings rates have have yet again been cut ahead of new ISA's going live on 1st of July. Sylvia Waycot, Editor at Moneyfacts.co.uk, said: “All hopes were pinned on July being the month our savings might start to offer a worthwhile return, but even the new £15,000 ISA limit has not sparked any interest from providers - literally. “Shockingly, the average rate on variable and one-year fixed ISAs has fallen since the Chancellor’s announcement in April whereas the non-ISA equivalents have had no such downward movement and non-ISA notice accounts have even risen. “Only the five-year fixed ISA shows a positive story with the average rate increasing by 0.08% - but with a BoE rate rise imminent it would be an odd time to lock money in a long term fixed account. “It seems that rather than a subdued ISA market we have a reluctant ISA market, but by providers rather than consumers. So whilst in one act the Coalition government sought to correct a huge disparity in the ISA market of savers being forced to split their annual ISA allowances between Cash and Shares ISA's by allowing savers to use the whole of their annual allowance towards a cash ISA rather than the existing 50/50 split between cash and shares, and then to boost the cash ISA allowance to £15,000, which compares against the existing cash ISA allowance of just £5,940. Against this is reflective of the banking crime syndicate that continues to suckle on the teat of the Bank of England through a myriad of schemes that results in effectively providing the banks with unlimited funding that has resulted in the collapse of savings interest rates that began in May 2012 and has been kept at sub inflation rates of systemic theft. The table shows that the tax payer bailed out Halifax continues to across the board pay abysmally poor rates of interest that are far below the official UK RPI Inflation rate of 2.4%. In my opinion savers either continue to effectively hand over their hard earned cash to the banks to systematically siphon off through persistent loss of purchasing power or they look at alternative asset classes such as the UK housing market that is currently trundling along at an average annual percentage rate of FIVE times the pittance that the likes of Halifax pays as covered at length in my new UK Housing Market Ebook available for FREE DOWNLOAD (Only requirement is a valid email address). The consensus view is that a rise in interest rates is expected to hit the housing market hard as mortgage interest payments would literally double even if the base rate only rose a couple of percent to 2.5% and thus triggering warnings of a reversal in trend amounting to a housing bear market or worse. However, my long standing view has remained since at least August 2013 as excerpted below that the primary driver for house prices is not interest rates but sentiment. Understand this, the housing bull market can sustain DOUBLE current mortgage interest rates i.e. 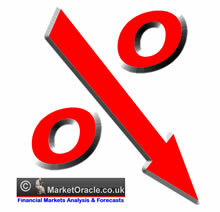 average fixed rates DOUBLING from the current 3% to 6% and similarly for variable rates. The updated graph reflects the latest Halifax house prices data (NSA) released for May 2014 at £185,747 which is set against the forecast index level for May 2014 of £185,544 which illustrates that house prices over the past 6 months have shown little deviation from the forecast trend and therefore the long-term trend forecast remains on track to achieve a 55% increase by the end of 2018. As house prices momentum is accelerating this suggests that UK house prices could trend slightly above the forecast trend trajectory over the summer months. The updated election forecast graph shows that contrary to the most recent opinion polls that put the Labour party ahead of the Tories (Observer - 35% Labour, 31% Conservative), instead the Tories have already started to enter into an outright election victory territory some 3 months ahead of trend trajectory, never mind the prospects for another Coalition government which now appear to be extremely improbable. In terms of the Scottish Independence Referendum, the current stealth Tory lead that is NOT apparent in the opinion polls is a goldilocks outcome for the Union for a Tory poll lead would encourage more Scots to Yes whilst a Labour poll lead would encourage more Scots to vote No. Off course with over 2 months to go it is inevitable that the opinion polls will narrow in the Tories favour. 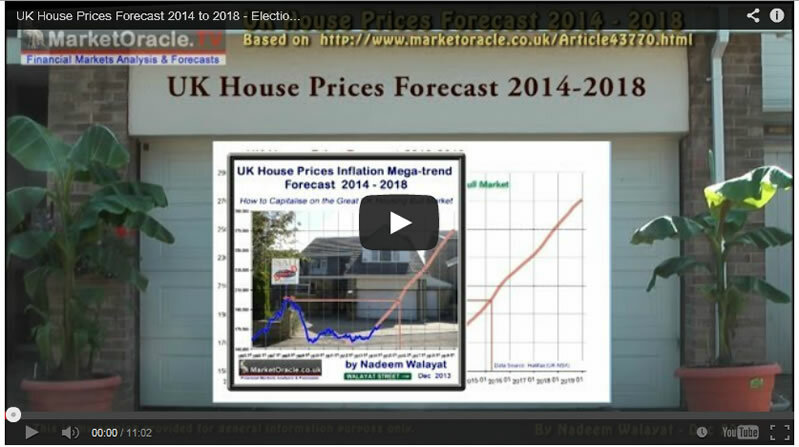 My next in-depth analysis will seek to update the current state of U.S. housing market, ensure you are subscribed to my always free newsletter to receive this in your email in box as well as access to my New UK Housing Market Ebook available for FREE DOWNLOAD (Only requirement is a valid email address).